It’s Time to Start Living the Life You’ve Always dreamt of. It all begins with an INTENTION…If you have big, bold, inspired intentions; then you are in the right place. 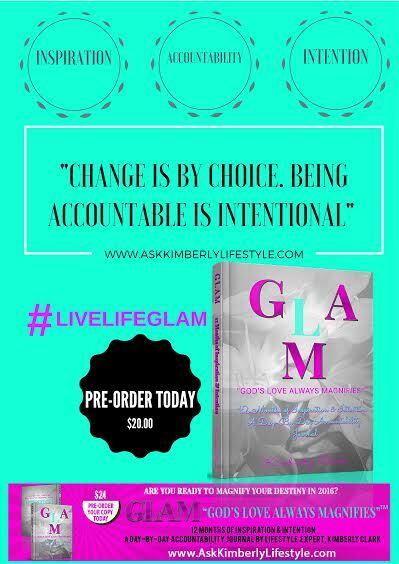 The book GLAM will help you monitor & manage your day-to-day. By providing you intentional steps that hold you accountable for the destiny you truly desire and deserve. Time to turn-up the volume and hold yourself accountable for your destiny. As this year comes to an end, 2016 will be the beginning to a "BETTER YOU" Setting the precedent for anything new starts with SELF. GLAM not only brings you 12 months of Inspiration & Intention but, you can start- A New at the beginning of the year, middle of the year or end of the year. It’s completely up to you. CLARITY & ACCOUNTABILITY- The clearer you are about how you want your destiny to be, the more likely you are to set the intention. If the intention is positive & proactive than the goal is achievable. The day-by-day journal is intended to help you better understand how your thoughts manifest your future. "It doesn't matter how slow you go to reach your destiny, just as long as you don't STOP." Live Everyday GLAM is DEFINING, VALUING, RESPECTING and MAGNIFYING the GLOW within YOU. As a Lifestyle Expert & Lifestyle Soulpreneur Kimberly helps you to move your life forward to-find fulfillment, success, well-being and happiness. AKL can assist you to pinpoint the blocks or obstacles that are making you feel “stuck” and help you to move through them. AKL guides you through a life transition, such as refresh career, renew or begin a new relationship. Ask Kimberly Lifestyle #AKL supports your goal-setting, personal growth, and behavior modification. The guidance and mentoring helps individuals achieve their goals by improving different actions necessary to take control of future plans. Kimberly Clark, Lifestyle Expert, Soulpreneur and Speaker of Ask Kimberly Lifestyle (AKL). AKL encourages, empowers and elevates individuals to fulfilling their potential and manifest the most out of life. That’s right – by loving yourself FIRST and MANIFESTING your thinking; there is no limit to living everyday FABULOUS. Kimberly’s passionate motivational speaking provides the drive and guidance her clients and audience need to improve their careers, relationships, and lives. 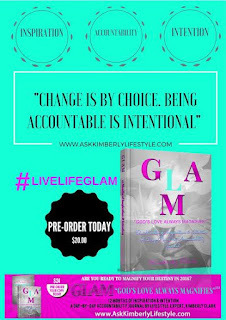 GLAM "God's Love Always Magnifies" ™ goal is to guide women in manifesting the future they truly desire. Kimberly Clark a renowned Lifestyle Expert with over twenty years’ experience; Author, Lifestyle Enhancement Speaker and a featured Love and Lifestyle Advice Columnist on Soul Kisses TV, personifies the Pure Essence of Love. Kimberly's Soulpreneur Self-Love Empowerment Coaching is a life experience in itself. GLAM has nothing to do with beauty, but EVERYTHING to do with loving you first. Are You Ready to Live Life GLAM?